Ketchup Kylie in front of the Oscar Mayer Wienermobile. Kylie Hodges graduated twice within one month. Once was from the University of Wisconsin-Oshkosh, where she turned her tassel and received a diploma; and once was from Oscar Mayer’s Hot Dog High, where she took an oath with a hot dog in hand. Even though Ketchup Kylie – as she’s affectionately known by her fellow Oscar Mayer Hotdoggers – just graduated in May, she has pursued the position ever since auditioning to sing the Oscar Mayer jingle as a little girl. Growing up in Madison, Wisc., home of the hot dog headquarters, Kylie saw the Wienermobile maneuver around town on a regular basis. After 14 days of Hot Dog High and 40 hours of Wienermobile driving training, she hit the road. For one full year, Kylie and one fellow Hotdogger traverse the northeastern part of the country, with Destiny’s Child music blaring from the van’s speakers. 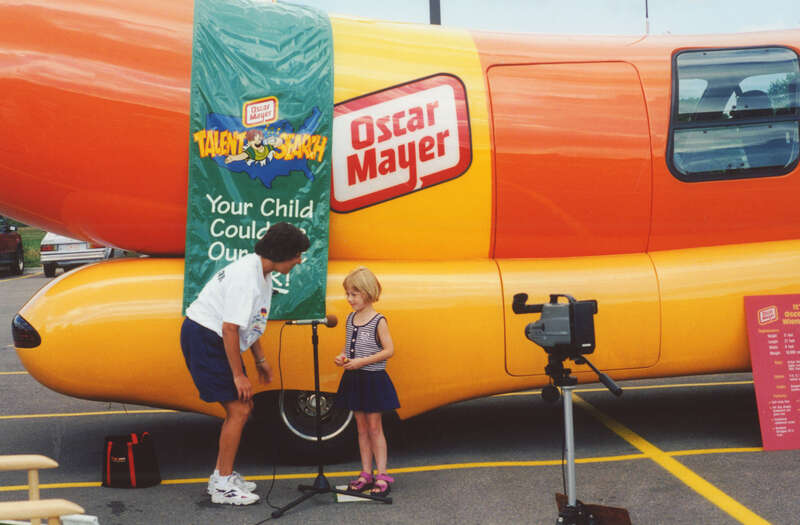 What the job entails: We’re brand ambassadors for Oscar Mayer and the Wienermobile, so we attend fairs, festivals, parades, and promotional events to talk with people and hand out coupons, stickers, and wiener whistles. How you got the job: Oscar Mayer’s Hotdogger program recruits at a handful of different major universities across the United States, but I knew I wanted this job since I was a little kid. I applied online and found out I got the job before graduation; I graduated on May 15 and started on June 5. Hot dog fate? Kylie, age 6, in front of the Wienermobile. Coolest part of the job: Last week, for the 75th anniversary of the Wienermobile, I handed out wiener whistles on the floor of the New York Stock Exchange while Oscar Mayer’s vice president rang the opening bell. Wow, the Mobile is 75 years old? Carl Mayer, the nephew of Oscar Mayer, designed it in 1936 as a way to sell hot dogs around Chicago. Over the years, it was revamped into a marketing tool. Now, it’s nostalgic to American culture. So you don’t sell hot dogs from it anymore? No. Something people would be surprised to learn about the job: People think we live in [the Wienermobile], but we stay at hotels every night. That must get pricey. On top of our weekly salary, Oscar Mayer takes care of our accommodations and gives us a food allowance. But I still negotiate for my stays when I tell hotels I’m bringing the Wienermobile, which teaches me about sales. Favorite part of the job: The Wienermobile brings out the gracious part of people. It’s magical to kids. I also love traveling the country; it’s like my own little study abroad. Most challenging part of the job: Sometimes, on my off days, I get homesick or don’t want to leave the hotel. But then I make myself go places, and I talk to the coolest people. Like whom? One family we met at the Safeway National Barbecue Battle in Washington, D.C. were huge Wienermobile fans, so they invited us over for a true Maryland seafood dinner and showed us around Annapolis. That’s something you won’t experience at a regular job. Ketchup Kylie and her co-Hotdogger, Dylan (aka Dyl-icious) in New York City. What does the Wienermobile look like inside? It’s painted to look like a sunny blue sky with clouds. The roof – which we call a “bun roof” instead of sunroof – opens up, so we can sit on top during parades and wave. The floor has condiment-splattered carpeting, and the door opens up like the DeLorean in Back To The Future (see left). The six seats are ketchup- and mustard-colored. You can’t possibly drive across the entire country all year. There are six Wienermobiles with two Hotdoggers per vehicle. We’re each assigned to a specific region of the country, and I do the northeast area, from Maine to Virginia and as far west as Indiana. Do the other Hotdoggers have names like “Ketchup Kylie”? Yes! Some include Turkey Dog Tyler, Beefy Brian, Deli Fresh Danica, Bacon Lettuce and Taylor, and Dyl-icious. They’ll probably all be at my wedding. Are you sick of hot dogs yet? No, since I usually eat at restaurants and hotels. Hot dogs were one of my favorite foods as a little kid – either with ketchup or some macaroni and cheese, if I’m feeling crazy. Your driving mix: Beyonce and Destiny’s Child before an event to get pumped up. During events, we play CDs with 20 different versions of the Oscar Mayer jingle – from the Beach Boys version to the hip-hop version to the Spanish version. What’s the prep process for becoming a Hotdogger? We attend Hot Dog High for two weeks, at the end of which we say an oath with a hot dog in hand. So I graduated twice in one month – once from college, and once from Hot Dog High. I’m not sure which I’m more proud of. Where do you see yourself at the end of the one-year gig? I plan to apply for NBC’s Page Program. Hopefully, in five years, I’ll be living in Los Angeles and producing for a live television show. Working as a Hotdogger is a great way to relish life, Kylie says. 1. To apply, submit your resume online or mail a hard copy to the Oscar Mayer Wienermobile Department. I altered my resume to include things I wouldn’t normally include, like hosting a college radio show called “Mama Kylie’s Feel Good Elixir.” Many Hotdoggers include theater or music experience. The close-knit group of Hotdoggers send each other letters and mix CDs in mail. 3. This is a job about being goofy; you can embrace your strangeness and dance like a weirdo outside the Wienermobile. Pretty much any Hotdogger will tell you it was the best year of their life. You’ll forever be a changed person, in a better way. Check out the Hotdoggers’ blog about their on-the-road experiences at Hotdoggerblog.com and follow Oscar Mayer at @OscarMayer and @Wienermobile. All photos courtesy of Kylie Hodges; for additional pictures, check out the No Joe Schmo Facebook page. PLUS: Click here for more Foodie Fridays, like the co-founder of Crumbs Bake Shop, a fortune cookie writer, and a flavor developer at Cold Stone Creamery! This entry was posted in Cool jobs, Foodie Fridays, Jobs for recent grads and tagged foodie friday, hot dog high, ketchup kylie, kylie hodges, oscar mayer, oscar mayer hotdogger, wienermobile by Megan Hess. Bookmark the permalink.